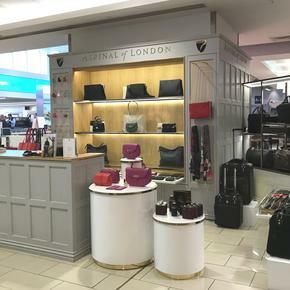 Whether you're jetting off to a sun-drenched destination, embarking on a business trip or returning from a quick getaway, pay a visit to our London City Airport store. Infuse your journey with a little luxury with our award-winning travel accessories or take care of the essentials with our line of impeccably crafted, functional cosmetic cases and wash bags. Our bespoke in-store personalisation service, monogramming your purchase allows you to add a unique finishing touch to a gift or distinguish your own accessories while our collection of handbags and briefcases communicate an uncompromising eye for style.